Ray Hermann is a licensed and ordained Christian minister, has a Doctor of Ministry degree, has been a fellowship pastor, taught Christian correspondence courses to foreign students, and was the editor of a quarterly religious magazine. He has written numerous Christian articles for various periodicals. Previous organization memberships included, Association for Pet Loss & Bereavement, Association of Bible Teachers, and Associates for Biblical Research. The Outlaw Bible Student project is non-denominational in nature and began as an educational outreach project started by New World Christian Ministries. Our mission is devoted to expounding the truths concerning God’s divine plan for humankind as written in the Holy Bible, both Old Testament and New Testament, and helping people to understand how God’s plan is relevant to their own lives. We are evangelical because we believe in a personal relationship with Jesus Christ and have a commitment to the demands of the New Testament. We believe in the confessing of sins and in Christ’s forgiveness. We are fundamental in that we believe in the virgin birth of Jesus, the atoning character of his death, his resurrection from the dead, and his second coming to establish an earthly reign. Although not Pentecostal, because we do not believe in speaking in tongues, we do believe that the Holy Spirit is God’s participating force which can empower someone in his service. We are progressive, believing in human sexual equality and that both men and women should have equal opportunities in Christian leadership. And we do not believe that science is the enemy of faith, but that science and Christian doctrine can be accommodated together. Financial support for our ministry is provided entirely by its members and the free-will gifts of those who wish to see our work continue. By providing a gift, you are taking an active part in helping others through teaching knowledge contained in, and related to, the Holy Bible. Checks sent should be made out to Rev. Ray Hermann and mailed to PO Box 1321, Bellingham, WA 98227. 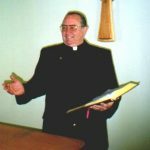 Raymond C. Hermann is licensed (#21499 OMP) and ordained by the United Christian Church, an inter-denominational and inter-racial fellowship, established for the purpose of promoting religious fellowship and teaching the doctrines of God Almighty and his son Jesus Christ. Their ministers must agree on certain fundamental truths, but honor each other’s opinions concerning varying ideas on different doctrines. The United Christian Church and Ministerial Association, chartered in 1956, is truly an international evangelical organization which spans the globe with over 30,000 ministers on six continents. Their ministers are authorized to perform and practice all religious ceremonies and activities pertaining to this office. They are authorized to establish churches and missions for places of worship and to minister and teach in various institutions. The United Christian Church and Ministerial Association is headquartered in Cleveland, Tennessee and is fully recognized by the government (county, state, and federal). Find The Outlaw Bible Student on Facebook, click here.